Treadmill Speed Work: How can you tell improvement? I’ve been doing speed work of 12 intervals of 400m (0.25 mile) each every other week during this training cycle. I completed my last 400m speed day last week (still have one more 800m day), so I thought I’d compare and see if I’ve improved. The most recent is on the left and a month ago is on the right. You can see that I did improve on each speed interval each time I did these. The problem is, I don’t know whether I really improved or did I just push myself faster on the treadmill each time? Is there a difference? I always start out more cautiously because I don’t want to burn out, having to go through twelve of these things. I didn’t, at any time on any interval, slow down my speed, so I think that has to count for something. Although, my notes for the January 7th run say, “Actually felt like I probably could have either done these faster or with less recovery time.” Because of this I started jogging part of my recoveries on the other runs. I would be interested in repeating these one more time on an actual track or flat pavement and seeing how they compare. Would I burn out early or would I push myself harder? Anyone out there do speed work on a treadmill? How can you tell if you’re improving or just pushing yourself harder? 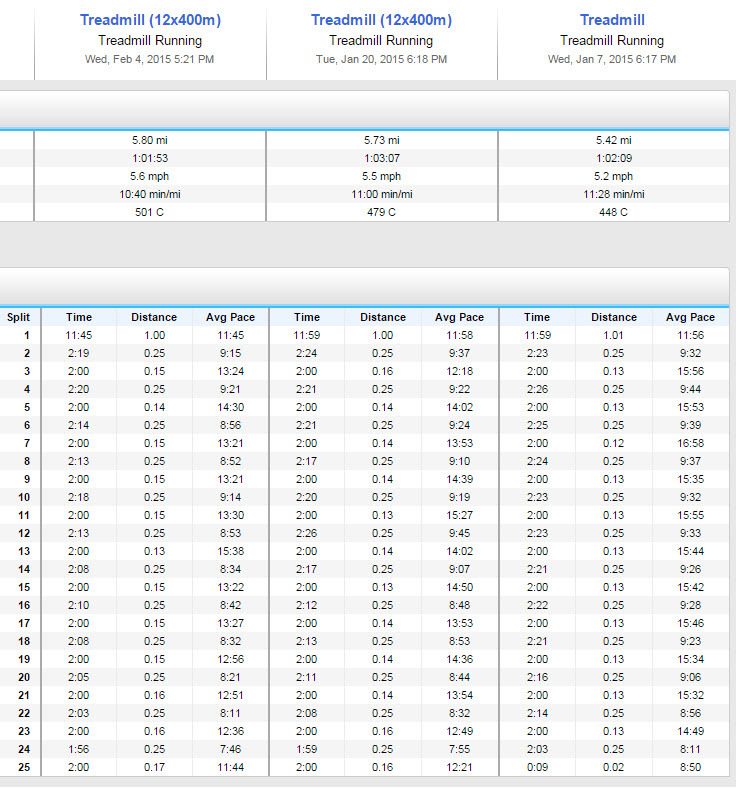 This entry was posted in Training and tagged speed intervals, treadmill. Bookmark the permalink. Pingback: Progressive Runner | Geeky Running News: A treadmill that follows your pace, instead of the other way around.